This article was written for “The Wheelmen” who kindly granted permission to reprint. 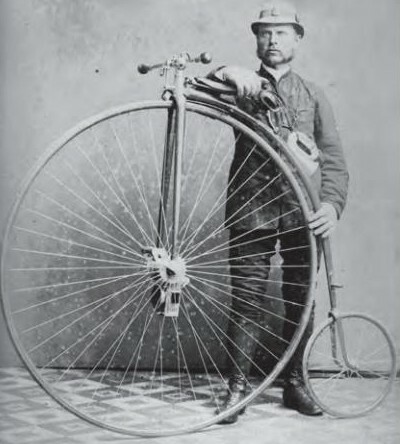 The bicycle bugle, along with the club uniform, was an indispensable part of highwheel cycling activities in the 1880’s. Nothing was more desirable for proper formation discipline and maneuvers of the cyclists than a well-recognized code of signals. The bugler rode prominently in the number 2 position to the left of the Captain. The bugle calls coordinated large groups of riders in tours and parades and added glamour to events. In today’s Wheelmen, a reduced set of codes (bugle calls) is still used, along with consistent use of uniforms in their variations according to state, to promote a good appearance to the public as well as increased enjoyment for the members in their awareness of a well presented ride formation. By definition, a bugle is a soprano brass instrument with a conical bore, which means that the diameter of its tubing increases constantly from the mouthpiece end out to the flared bell end. By comparison, a trumpet will have a similar length of tubing, but its bore is cylindrical, remaining the same diameter until closer to the bell end when it starts to increase. For our purposes, only true bugles should be considered for use in Wheelmen activities. This section of the bulletin describes some of the principal differences between similar instruments, and their characteristics, to assist the bugler in selecting an appropriate instrument. 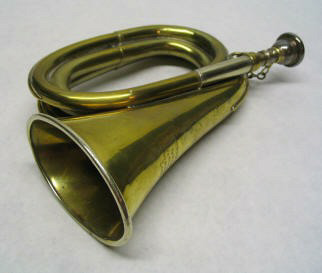 The most popular “bugle” available today is the so-called “Boy Scout Bugle”. 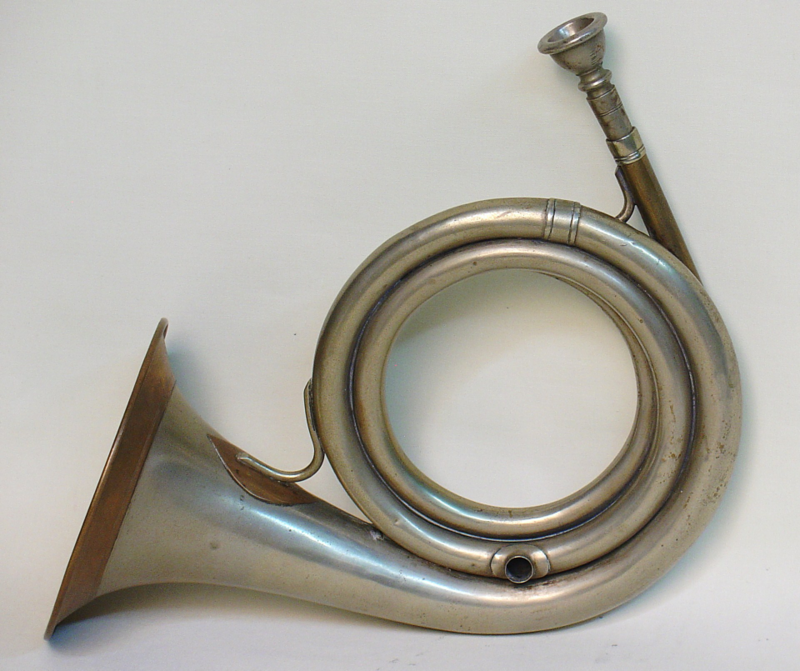 This instrument showed up in 1892 as the type specified for the US Army, and is more officially known as the “1892 US Regulation” field trumpet, but is often incorrectly referred to as the “US Regulation Bugle”or “1892 model bugle”. A photo of this instrument is shown in figure 1, and it is clearly a cylindrical instrument, and hence historically inappropriate for Wheelmen activities. Note that this type of instrument has a “2 turn” configuration, meaning that the tubing is wrapped to make two full loops, or turns, between the mouthpiece and the bell end; this means that the instrument’s overall dimensions will be somewhat larger, and as such it is unwieldy for use on a bicycle of any type. Another common instrument is the “trench bugle” that originated in 1894 and was common in WWI. They are often incorrectly referred to as “US Regulation” bugles, so knowledgeable people avoid using this term. 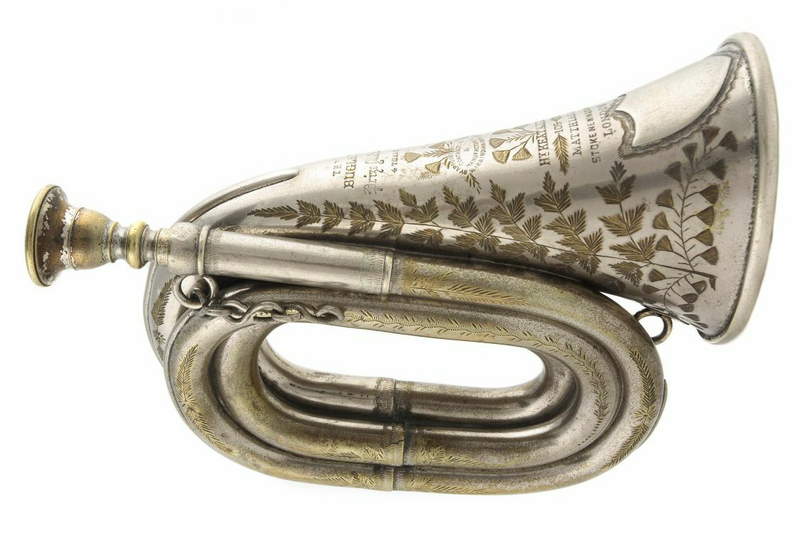 This instrument is a true bugle, and is much closer to being correct for Wheelmen activities than the 1892 “US Regulation” field trumpet. A photo of this instrument is shown in figure 2. The trench bugle has a “3 turn” configuration, making for a more compact overall size, and thus more suitable for use on bicycles. Actual “bicycle bugles” are not only true bugles, but they are also compactly wrapped. Generically, they can be any compactly wrapped bugle, hence the “trench bugle” or the “post horn” will be possibilities. Ideally, the first choice of a Wheelmen bugler should be one of the purpose-made instruments with very compact wraps and flattened bells that are less cumbersome and which fit better against the body (on a leather shoulder strap) when not being played. A popular maker of such bicycle bugles was Henry Keat & Sons of London, who mostly produced bugles for the military and the East India Company. 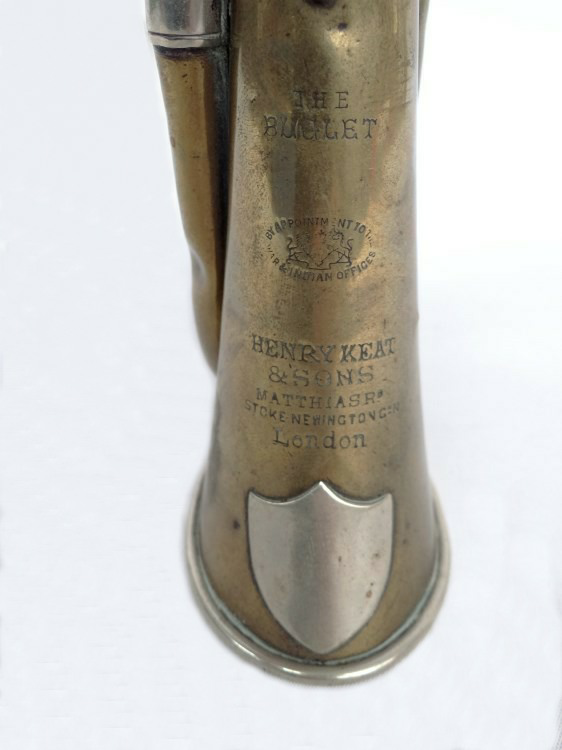 Keat produced approximately 60,000 “buglets” for cycling use, and many are still available today, albeit not inexpensively. Figure 4 shows a Keat buglet with a round bell, figure 5 shows a Keat buglet with flattened “oval” bell, and figure 6 show a better view of the characteristic flattened bell. Instruments of this type are ideal for use with Wheelmen events, with the other types of compact bugles being second choices. Most purpose made bicycle bugles will have “3-turn” configurations. Having described the ideal configuration of bugles for bicycling use, it is important to mention the “key” of bugles and how to choose from the different keys available. With any brass instrument, the length of tubing between the mouthpiece and the bell determines the actual musical pitches, or notes, that can be played. The lowest possible pitch is the “fundamental”, as defined by the wavelength of vibrating air in the tube, with only half of the wavelength actually present in the length of tubing. Musicians and physicists refer to the “fundamental” as the “1st harmonic”, or alternately as the “1st partial”. The next possible pitch in a length of tubing is twice the frequency of vibration, and in this case the wavelength in the tubing is half as long as with the fundamental, end hence the full wavelength fits inside the length of tubing; this condition is the “2nd harmonic/partial”. The next stable vibration is where one and a half wavelengths fit inside the length of tubing, and this is the “3rd harmonic”. More harmonics exist above this, each some multiple of the wavelength relative to the tubing length; refer to figure 7. Bugles are usually manufactured to be in the following keys: B-flat (Bb) or G are the most popular, with bugles in C being rare; some documents refer to E-flat (Eb) bugles, but these are actually Eb trumpets. The Bb has the shortest length of tubing, and the G has the longer tubing. 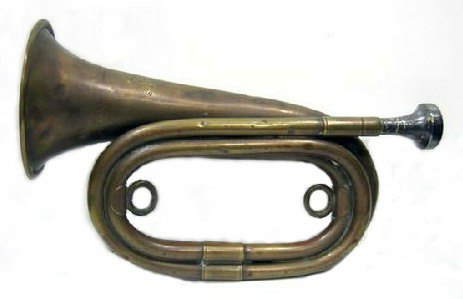 The 1892 US Regulation field trumpet, aka Boy Scout Bugle, is pitched in G, but most of these have a pull-out slide near the mouthpiece that allows the instrument to be slightly lengthened, lowering its pitch to F; use as an F instrument is rare. Trench bugles, many soprano posthorns, and most purpose made bicycle bugles are pitched in Bb. The “key” of the bugle refers to the actual musical pitch of the instrument’s fundamental, so for example a Bb bugle’s fundamental is a Bb pitch, and its useful scale begins one octave higher with another Bb (the 2nd harmonic). Although considered by itself, it is not important which key of bugle a bugler chooses to play, as long as that bugle will be used by itself; bugles of different keys cannot be used to play together on the same bugle calls! For Wheelmen activities, there should never be more than one bugle sounding the calls at any given time, although by agreement different buglers might be chosen to play at different times during an event. More on the suitability of different bugles”keys” later.. Refer to figure 7. This illustrates the various harmonics of a bugle in the key of C, using a conventional treble staff . The fundamental, or 1st harmonic, is one octave below “middle C” on a piano; using Scientific Pitch Notation, also known as American Standard Pitch Notation, this low C is named”C3″, but the chart also shows the equally popular Helmholtz naming system of “c”. The fundamental is not practical as a useful note on most bugles. The next possible note on the C bugle is one octave above the fundamental, and this is known as the 2nd harmonic, named C4 or c1; this is the same as middle C on a piano. While the 2nd harmonic is quite playable, it is rarely required by most bugle calls. The 3rd, 4th, 5th and 6th harmonics are the ones that are both easily played and also are most commonly required to play most bugle calls. The 7th and 8th harmonics, while possible for more skilled players, are rarely called for. An important point is that bugle calls are ALWAYS notated as if the bugle were in the key of C. There is no change in the notation when bugles in Bb or G are used. This can present a small problem when a novice bugler is trying to learn the available pitches. A good method to use for this is to try sounding the lowest pitch, and this should be the 2nd harmonic. 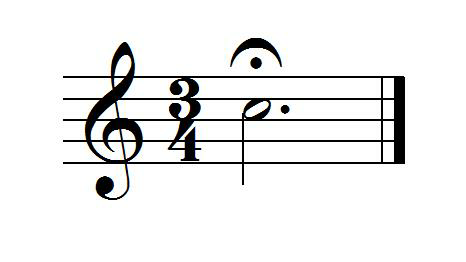 Check this against a piano or other instrument of known pitches, and find out if that 2nd harmonic matches a known Bb or G. Once the novice bugler thinks the key of the bugle has been discovered, try playing a simple call such as “Mount”, and verify that the starting note, written as a G4, matches one of the following known pitches; an F for a bugle in Bb, a G for a bugle in C, or a D for a bugle in G.
Another way to determine the key of a bugle is to measure the length of the tubing. Use a flexible tape measure such as used for sewing clothing, because a metal tape measure is too stiff and will cause significant errors in measurement. Start at the end where the mouthpiece goes, and measure along the center line of the tubing, NOT along its edge. Take note of the measurement at the rim of the bell. A bugle in Bb will measure approximately 54 inches, a C bugle will be about 48â€, and a G bugle will be 64â€. Don’t worry if the measurements don’t match exactly, since there is enough difference in the bugle lengths that small measurement errors can be ignored and the closest measured length to the above references will suffice. SIDEBAR: For the technically curious, here is the math for finding the key of a bugle, or any similar brass instrument, from its measured length. 1. The actual antinode at the bell end of the vibrating air column is located out in the open air in front of the bell rim. Multiply the measured tube length by 1.07 (to get 107%) to estimate the actual vibrating air column length. 4. Find a physics reference to look up the musical pitch associated with the frequency found in (3) above. A Bb2 is 116.54 Hz, a C3 is 130.81 Hz, and a G2 is 98.0 Hz. 5. To go the other way (fundamental frequency to measured length), find the frequency of that fundamental, divide 13526.5 by that frequency (the result is the wavelength), divide by 2 to get the half wavelength, multiply by 0.934 (the reciprocal of 1.07) to get the length of tubing (on an instrument with a bell flare, such as bugle) as measured from mouthpiece to bell rim. Isn’t this fun? A good bugler should arise from the ranks of those Wheelmen who are already experienced in the playing of upper range brass instruments, such as trumpets, cornets, French Horns, and of course the bugle itself. While it is possible for other to learn to play the bugle adequately, it takes considerable time and effort to develop the necessary embouchure (trained and strengthened facial muscles around the lips) required to produce clear and good sounding tones. An experienced player can more readily focus on learning the small set of bugle calls by heart. In no event should bugle calls be played in public situations by inexperienced players; it is better to have no bugle calls than to have poor or unclear sounding calls. Having said this, a novice bugler does not need to read music to learn the bugle calls. The bottom note (2nd harmonic) and the next three harmonics should be easily played even for a beginner, at least in a rough way and imprecise way. Start with the bottom note (2nd harmonic) and count up. The music of bugle calls is easy to read because there are only a total of four notes used in most of them. Play the lowest note, then the next highest note, and this will be the notated G4. Practice playing up and down the series of pitches from G4 through G5 until you can easily produce them and know what they “feel like” to your facial muscles and “sound like” to your ears. Once you have this done, via practice, the rest is a matter of playing more to strengthen those facial muscles and in the course of this memorizing the dozen most useful bugle calls. Besides learning to play the bugle adequately and memorizing the bugle calls, the bugler needs to be able to play credibly in the saddle while guiding the bicycle with one hand. Playing while riding is more difficult than playing while standing on the ground, so more practice while riding is important. The captain should audition an unknown bugler before parading; again, it is better to have no bugle calls that it is to have poorly played bugle calls, or to have a crash because the bugler is incapable of riding safely while playing. Some additional tips for the novice bugler. Notes are to be sounded as though “spitting a hair off your tongue”. While the beginner tends to raise the pitch by pressing harder against the mouthpiece or blowing harder, the expert achieves this more readily with lip tension. This accomplished by a combination of skill and pure physical conditioning. The novice should practice only a few minutes at a time initially, gradually adding more time to the practicing as physical conditioning improves. When the same note, or different notes, are to be produced in rapid succession, it is generally done by “double” or “triple” tonguing. When producing a single note (that imaginary hair on the tongue) you move the tongue as if trying to say “ti”. To double tongue, move the tongue as if trying to say “ti-ki”. For triple tonguing, say “ti-ki-ta”. If the bugle “gurgles”, this is an indication of water trapped inside the tubing; contrary to popular belief, this moisture is mostly condensed water vapor from the player’s lungs, and very little saliva is present. Remove the mouthpiece and rotate the bugle until the water runs out one end or the other. To prevent unsightly stains on the bell, learn to rotate the bugle in the direction that causes water to run out the mouthpiece end (remove the mouthpiece first). 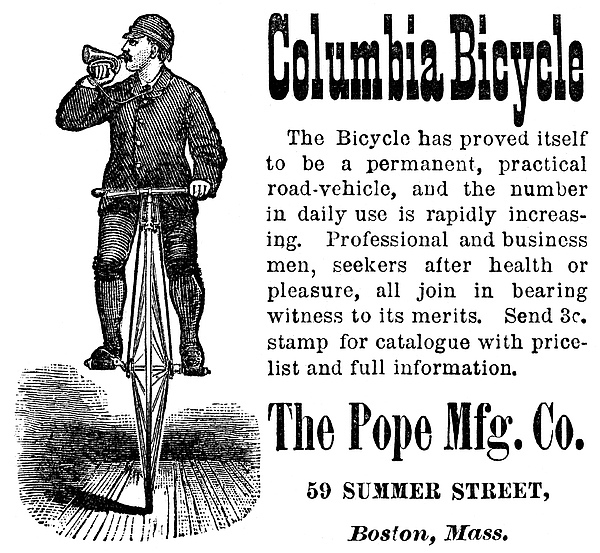 The calls reproduced in this bulletin are taken for the most part from the manual titled “The American Bicycler” by Charles E. Pratt, editor of “The Bicycling World” as published in 1880 by The Pope Manufacturing Company of Boston. 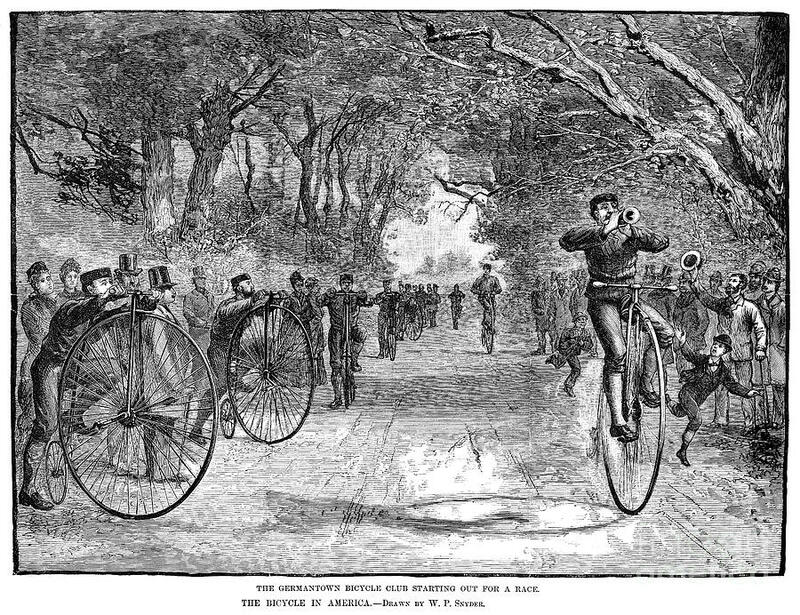 Additional calls were taken from earlier editions of The Wheelmen Handbook, ultimately originating with other period publications. The editor has selected a dozen of the most commonly used calls for inclusion in this bulletin, and all members are encouraged to learn them. In most cases the calls are short, simple, and by their tones and rhythms come close to suggesting the associated actions. For example, a slow series of the same note indicates a slower pace, a quick series of the same note indicates a faster pace, an ascending series of pitches is for mounting while a descending series is for dismounting. ATTENTION This is the cavalry call “Attention” and is used to precede the other calls, so riders know to start listening for the important call that follows. This call can also be used at other times for the purpose of calling order. PREPARE TO MOUNT This is the cavalry call “Boots & Saddles”. At the sound of it, riders place their wheels in line as previously arranged by the captain, with hands on handles and foot on step, ready to mount. MOUNT This is the cavalry call “Mount”. At the sound of it, the first rider, or first row of riders, will start their cycle rolling and mount, and the riders behind will follow in order. SINGLE FILE This is the military order “˜To Arms” and is given when riding abreast to order the riders to merge into a single file column of bicycles. The merge is always done by having the rider(s) to the left merge to their right, with the riders furthest to the right remaining in their existing line. It is usually necessary for the column of riders to adjust speed somewhat when merging, unless the spacing of riders was already great enough to allow the merging riders to move into those spaces without an adjustment of speed. TWO ABREAST – This is the cavalry call “Trot”, but in bicycling tactics it means two-by-two, or to ride in a double column. This should be done by having the second rider behind the leader moving to the left and then advancing to position next to the leader; all following groups of two riders would perform the same maneuver simultaneously. FOUR ABREAST â€“ Less often used, when this call is issued the first three riders maneuver into position to the left of the first rider, and following groups of four do likewise. DISMOUNT â€“ This is the cavalry call â€˜Dismountâ€™, and will be sounded to order riders to dismount either at the end of a run, or for rest, or for walking up a hill, or for other purposes when road hazards or busy crossings or congestion requires. This order should be obeyed from the rear, with the last rider dismounting first so that no collision is caused. This call by itself means to dismount and walk the bicycles; if actual stopping is required, this call shall be followed later or immediately with the call for â€˜Haltâ€™. HALT – This short call may be given at any time for ordering a standstill. If given abruptly while riding, it will order that riders dismount and halt at once, with as much promptness and care as required to avoid collisions, but without observing the order of riders dismounting. The difference in whether dismounting should be orderly or abrupt is what determines this callâ€™s use while riding with or without a preceding “Dismount” call. QUICKEN PACE This urgent sounding call is easy to understand, and orders that riders increase their speed. SLACKEN PACE â€“ This languid sounding call is also easy to understand, and orders that riders decrease their speed. TRICK RIDERS â€“ This call may be used, when the situation is appropriate, to call for the trick riders in the ranks to perform demonstrations of skill. In a moving group of riders, the trick riders should move out of position and perform beside or ahead of the other riders. When the group is at a standstill, the trick riders should begin a sequence of demonstrations. â€˜Haltâ€™ may be used to terminate the tricks if the other riders are at a standstill, or when the group is moving another call such as â€˜Single Fileâ€™ may be used to call the trick riders back into the formation. HATS OFF â€“ This call is given to order riders to remove their hats and hold them aloft as a greeting, salute, or acknowledgement (such as when other vehicles stop to allow riders to pass). Books and booklets on bugling include The Wheelmen Handbook (fourth edition or later), “The Coach Horn: What to Blow and How to Blow It by an Old Guard” by Kohler and Son, “Orchestral Wind Instruments” by Ulric Daubeny (1919), “Horn Technique”€ by Gunther Schuller (1962), “American Bicycler” by Charles E. Pratt (editor of The Bicycling World, April 3, 1990), “Bugle Signals, Calls and Marches” by Daniel J. Canty (1916), “Complete Instruction Manual” by V.F. Safranek (1942). Further information can be obtained from the current Wheelmen national bugler; see The Wheelmen Magazine (inside back cover) or the website (www.thewheelmen.org) for the name of the current national bugler. Paul Schmidt is a military ‘brat’ who lived outside the USA (Japan and Germany) until well into college. He plays or has played most of the band and orchestral instruments during his life, and still plays low brass semi-professionally. He also is anÂ advocate and enthusiast of the Serpent and Ophicleide, playing in the States and Europe, writing related articles, lecturing, conducting workshops and clinics, editing the Serpent Newsletter and serving as webmaster of the Serpent Website. He is an active member of the 1st Brigade Band and is assistant curator of the Heritage Military Music Foundation collection of Civil War brass instruments. He is also an officer of the antique bicycle organization ‘The Wheelmen’, and serves as its Illinois State Captain, and frequently travels the Midwest and eastern states to promote interest in antique bicycles. Sources of bugle calls were suggested and furnished by Wheelmen bugler Alex Pollack. Bugle calls were selected for this bulletin by Illinois Captain Paul Schmidt. The bugle calls and bugle scale were computer engraved by Dan Woolpert of the Heritage Military Music Foundation. Information on suitable bugle types was provided by Alex Pollack. Information on bugles, their characteristic scale, their history and other technical and practical information was contributed by the “nation’s bugler” Jari Villanueva. Additional information was paraphrased from the 6/92 edition of Wheelmen Bulletin 6. The New Langwill Index of Musical Wind-Instrument Makers was consulted. Information was selected and edited for this bulletin by Paul Schmidt. This entry was posted on Saturday, March 24th, 2018 at 10:32 pm	and is filed under Bugle Stories, Buglers Through History, History of Taps, History of the Bugle, News, Taps in Recent History, Taps Performance Guidelines, Uncategorized. You can follow any responses to this entry through the RSS 2.0 feed. You can leave a response, or trackback from your own site. I spent 23 years sounding Taps at Arlington National Cemetery. Each and every one of those families deserved a live rendition of the bugle call, not a recording which is played too often around the country today. If we can t provide that final honor as a nation, then we need to be ashamed. What a wonderful and thorough piece on the bicycle bugle. Now that I actually have one it’s rewarding to be able to see and play the authentic calls.